We thank the many wonderful people who have communicated with us, offering their support and prayers. We thank each of you who is praying for us right now. If you have questions or concerns, please contact general manager Tom Busch by telephone, 907-443-5221. This mission is strong because of you, and words fail to express how greatly we appreciate your financial and especially your spiritual help. DESPERATE FOR SPRING (left): Deputy KNOM news director Julia Dunlap grew tired of waiting for tundra flowers to brighten things, so she drew her own on Studio A’s glass window. The first real flowers appear in early July, during Nome’s short growing season. On average, we remain above freezing from early June to mid-August. TRANSLATOR ACTION: April 16th we appealed the FCC’s decision to throw out all of our eleven applications for translator repeater stations in remote villages. It’s troubling that we have suffer through such extraordinary measures to simply give a handful of scattered villages their first excellent radio signal ever. We will keep you in touch. We extend sincere thanks to consulting engineer Jack Mullaney and attorney Chris Ornelas of Wilkinson, Barker Knauer, LLP, who generously contribute their services to our mission free of charge. YOU’RE BREAKING UP: May is the month when rivers and streams melt with ferocity. Ice jams can form, sometimes flooding entire villages. Known as “breakup,” it’s a period when KNOM listeners stay close to their radios to learn what’s happening upriver and downriver from them. feels them give way beneath her - and yet sings, knowing that she has wings. 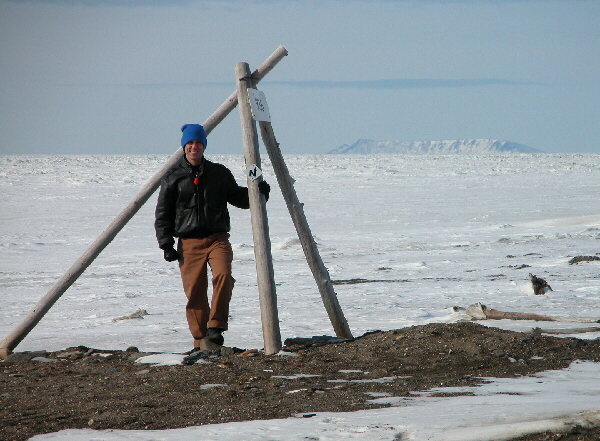 THREE-LEGGED RACE (left): On a balmy April day, KNOM news director Paul Korchin poses by an Iditarod Race marker tripod on the Nome beach. In the distance, you can see uninhabited Sledge Island, about 25 miles due west. Tripods like this dot many miles of the trail from Anchorage, and help keep mushers on track when visibility is poor. DISCUSS: “KNOM Profiles” is a daily interview program, currently produced by volunteer Clinton White. On recent shows, you’d hear discussion of the need for assisted care living in rural Alaska, suicide prevention, art in schools, job training, Alaska native heritage, education, and many other topics. Originally titled “KNOM Village Report” in 1979 and later “KNOM Feature,” the show took its present name in January 1996. Over the years, it has been a vehicle for more than 6,500 different educational interviews. Thank you for helping to make this program possible! 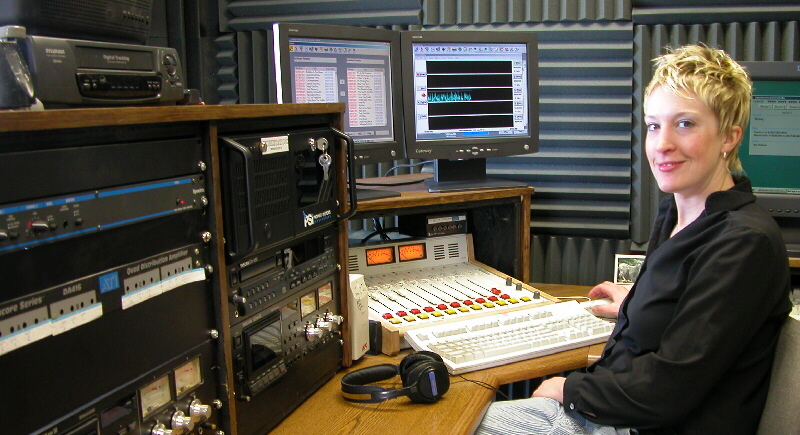 ONE QUARTER MILLION HOURS: KNOM has broadcast around the clock since January 9, 1996. Prior to that, we were on the air for 18 hours a day, and for our first year, 16 hours. For several summers in the 1970’s, we extended our broadcast day to 20 hours. Power outages have taken us off the air many times, for as long as a day at a time. And we’ve gone off the air deliberately for antenna maintenance. Thus, it’s impossible to count exactly how many hours KNOM has been on the air since the mission signed on July 14, 1971. Our best guess is that we will reach the 250,000-hour mark on approximately Easter Sunday, April 16, 2006. Should be planning a celebration for that day? “WATER” THEY THINKING? KNOM volunteer Clinton White noticed an oddity the other day. In Nome, the price of gasoline is $2.43/gallon. Meanwhile, a gallon of drinking water, including tax, costs $5.55! The reason for the disparity is that while gasoline is transported here by oceangoing vessels, commodities like water are shipped by air. We can’t imagine anyone buying water at that price! INSPIRATIONAL SPOT: The Iditarod Trail is marked by sturdy tripods; a single post will not hold up to an Alaskan winter. Each post must be perfect, or the tripod will topple in the wind. Three posts fastened together. Just as it is with the Blessed Trinity, three Persons in one God. FAMILY PORTRAIT (left): KNOM’s five volunteers pose, from left: music director Anna Dummer, public affairs director and morning deejay Amy Flaherty, public affairs specialist Clinton White, deputy news director Julia Dunlap and production director Emily Barrett. Anna and Clinton have signed up for second volunteer years. The other three will be ending their own second KNOM volunteer years. Julia will be leaving the state, while Emily will remain in Nome and re-join her chosen field of social work, and KNOM will hire Amy as a permanent employee. Please offer a prayer now and then for these generous young folks, won’t you? FAR, FAR, FAR-FLUNG: In April KNOM volunteers Emily Barrett and Clinton White made separate trips to extremely remote Little Diomede (DYE-uh-meed) Island. Emily recorded interviews for KNOM, while Clinton’s visit was a photographic mission, photographing elders for educational posters. The tiny island is located in the windswept Bering Strait, 134 miles northwest of Nome. Except for a small area facing Russian Big Diomede Island, 2-1/2 miles away, the steep island is uninhabitable. It’s one of the thirteen villages in which we hope to install translator transmitters. Each year after the ocean freezes, villagers bulldoze a short landing strip on the ocean ice, about a hundred yards on the American side of the International Date Line. “We probably shouldn’t mention that our plane crossed into Russian territory as we circled to land,” Clinton says, noting that a week before his trip, the south end of the runway had broken off and drifted out to sea. 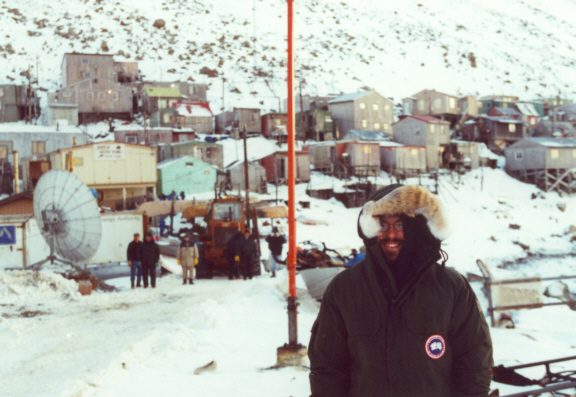 (Left) KNOM'er Mike Nurse, with the village of Little Diomede behind, in a 2000 photo. At Easter, western Alaska’s few priests scramble to serve as many villages as they can, but many places do not have the opportunity to worship at a local Mass. Thank you for your support, which provided thousands with an Easter Mass via the KNOM mission. INSPIRATIONAL SPOT: Lord, I pass You by so easily. I get distracted by problems I pick up along the way. Jesus, please teach me to turn to You when I am burdened. INSPIRATIONAL SPOT: What in your life is causing you pain? Resentment? Take your cup to the Lord and ask Him to empty it of resentment and guilt, and to fill it with the sparkling forgiveness that God can give. MEET KELLY BRABEC (left), KNOM assistant program director, in Studio “Z” upstairs. It’s where most music and recorded programs from other locations are dubbed into the computer system that controls the station. Kelly served as a KNOM volunteer between 1998 and 2000. Like every other permanent KNOM employee, she left with no intention of returning, but was guided to return two years ago. 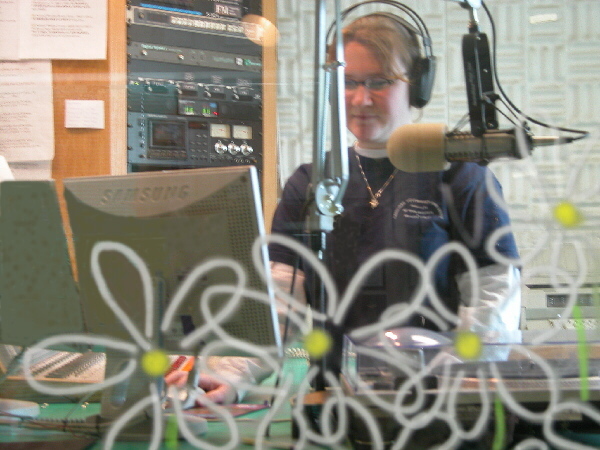 Among Kelly’s responsibilities is the daunting task of scheduling, and in her words, “ensuring that the overall sound and flow of KNOM is listener-friendly and positive.” She deejays weekday afternoons, and her voice is on many educational spots. Kelly enjoys many different outdoor sports, as well as painting. She participates in the Big Brother Big Sister program, continues as a part-time youth counselor at Nome’s youth detainment facility, and serves as a Eucharistic Minister at St. Joseph Parish. THIRTY YEARS AGO: May 16, 1974 brought Nome the last blizzard of the winter. WILFULLY: It’s a surprising fact that about half of adults in the United States have not made a will, and thus have no say in how their possessions will be distributed. We urge you to make a will, if you have not already. Once your loved ones are taken care of, we ask that you consider adding missions like KNOM. Often, such a final gift will be the largest that a person can make. At KNOM, we accept such gifts with prayer. We carefully place them in accounts that will protect the mission from future emergencies, and will provide future major improvements. Once again, we offer our most sincere thanks for your financial gifts, and especially your gifts of prayer. May Our Lord bless you abundantly for your generosity. INSPIRATIONAL SPOT: Lord, help me to live this day quietly, easily, to lean upon Your great strength trustfully, restfully, to face tomorrow confidently, courageously. INSPIRATIONAL SPOT: Snowflakes are one of nature’s tiniest and most fragile things. But look what they can do when they stick together!